Pacific Northwest Folklore Society Coffeehouse Concert. STEWART HENDRICKSON & THE WHATEVERLY BROTHERS. An evening of sea songs and chanteys, Aarrr! Stewart, Seattle's fiddling maritime singer, will sing songs of the sea accompanied by guitar and interspersed with fiddle tunes. The Whateverly Brothers (Chris Glannister, Matthew Moeller and Dan Roberts) draw from the finest traditions of vocal harmony to present sea songs and chanteys. Weigh anchor! Raise the glass! Sing along! Free, 8-10 pm, The Wayward Coffeehouse, 8570 Greenwood Ave N, Seattle. THE BALLADEERS - STEW HENDRICKSON, BOB NELSON, JERRY MIDDAUGH. Songs and fiddle tunes from the British Isles and America by Stewart Hendrickson (fiddle, guitar, vocals), Bob Nelson (guitar, vocals), and Jerry Middaugh (banjo, guitar, vocals). Enjoy the music with the Bakery's good food - Special Dinner Menu. Flying Apron Bakery, 3510 Fremont Ave N. 7-9pm, free, donations welcome. Info: 206-442-1115. STEWART & BETTY HENDRICKSON and JILLIAN GRAHAM. Presented by the Everett Public Library & The Pacific Northwest Folklore Society. Free, Everett Public Library auditorium, 2702 Hoyt Ave. Everett, WA. Tacoma’s Foss Waterway. The festival grounds extend from Thea’s Park south along Dock Street to the 21st Street Bridge. Traditional slow airs were often derived from songs, and many songs are sung to the tunes of traditional airs. This workshop will explore these relationships, with examples of both. STEWART & BETTY HENDRICKSON & JERRY MIDDAUGH. 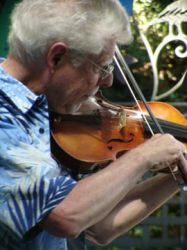 Traditional songs from the British Isles & America along with fiddle, guitar & hammered dulcimer. An afternoon concert followed by a potluck dinner and jamming into the evening hours. At a beautiful B & B (Best Places Northwest, 2007) near the Columbia River in SW Washington. REVIEW: "The musical tapestry so creatively woven by the ensemble--Stew with his poetry, guitar, fiddle, and beautiful sonorous vocals, Betty with the delightful, delicate melodies dancing from her hammered dulcimer (joined by Jerry's quiet underlying counterpoint), and Jerry's precise guitar work complementing his resonant vocals--kept the audience mesmerized from start to finish. Overall this was a great concert and a marvelous experience--an eclectic collection of traditional folk music from the British Isles and America played with sensitivity, expertise, and flair--if you ever have the opportunity to hear them play, jump at the chance, as it is an experience you will cherish!" Doug Sheresh, Communications Director, Wahkiakum Acoustic Guitar Society.